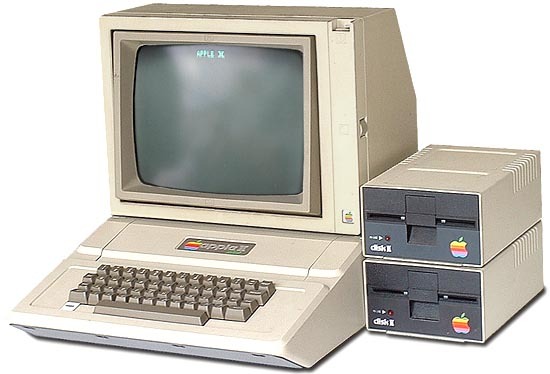 The Apple II, or Apple ][, became one of the most popular computers ever. Although it is a vast improvement over the Apple I, it contains the same processor and runs at the same speed. New features include a color display, eight internal expansion slots, and a case with a keyboard. That may sound funny, but the Apple I and many other early computers didn't necessarily have a case or even a keyboard. 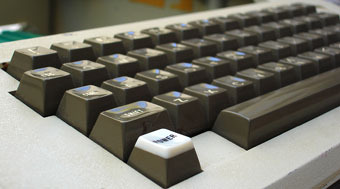 On some systems you had to added your own keyboard, if possible, and on others you toggled switches to enter programs and issue commands. 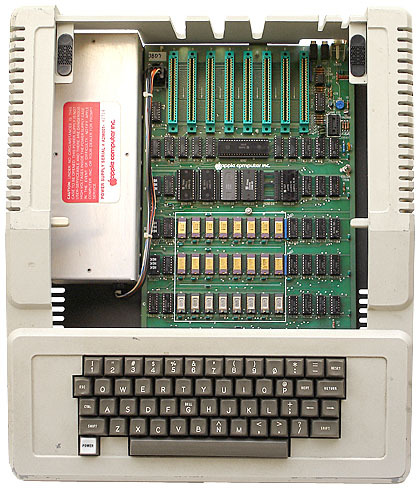 In the spirit of the original computer hacker, the Apple II was also available as a circuit-board only, without keyboard, power supply, or case, as seen here on the right. The Apple II was one of the first computer with a color display, and it has the BASIC programming language built-in, so it is ready-to-run right out of the box. 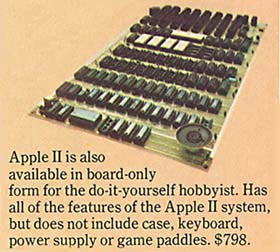 The Apple II was probably the first user-friendly system. The most important feature of the Apple II was probably its eight expansion slots. No other computer had this kind of flexability or expansion possibilities. The top of the computer isn't even attached, it lifts off with little effort allowing easy access to the system motherboard and expansion slots. 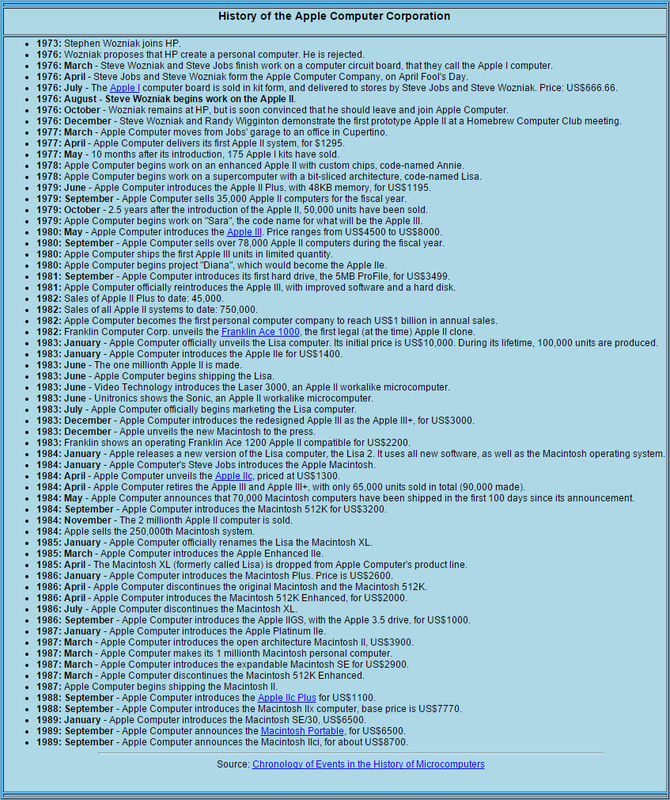 Dozens of different expansion cards were made by Apple and other manufacturers to add to the Apple II's capabilities. These include - memory expansion, floppy disk controllers, PASCAL and CP/M emulator cards, parallel, serial, and SCSI cards, processor accelerators, video cards. But what made sales of the Apple II take-off was the new spreadsheet program VisiCalc. If you're familiar with Microsoft Excel, then you know what a spreadsheet program does. It adds columns and rows of data and instantly gives you the results. This was the first affordable program to perform such an amazing feat, something which corporate accountants previously spent hours laboriously calculating by hand. VisiCalc transformed the Apple II into a serious business machine. It was apparently released on the Apple II before any other system due to Apple's rather large memory size, since the Apple II could support up to 48K of RAM. VisiCalc was the first so-called Killer App - many businesses bought the Apple II computer for the sole purpose of running VisiCalc. 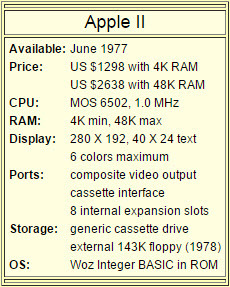 Both of which are similar to the Apple II, but with many new features and upgrades built-in. One version of the IIe had a numeric keypad built into the right side of the keyboard. 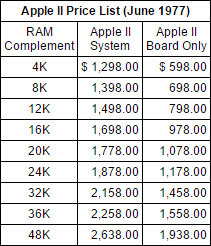 Apple continued to produce and sell Apple IIe's up until 1993, extending the life of the Apple II series past 15 years! One month after the Apple II was released, BYTE magazine published an article about the Apple II computer. This article was written by the creator of the Apple II computer, Steve Wozniak.